IK Multimedia's BlueTurn Wireless PageTurner Footswitch is a compact Bluetooth page turning solution for iPhone/iPad, Mac and Android that lets you turn pages with your feet while performing. It comes with two highly visible backlit soft-touch buttons that you can trigger with your feet to turn pages, leaf through lyrics, scroll slides and more in your favorite apps and software. Now, with the BlueTurn, you'll be ready to perform at your best whether you're conducting an orchestra, playing music from a score, playing guitar or bass tabs, giving a presentation or making a speech. With the BlueTurn Wireless PageTurner footswitch, it's your turn, literally. Its two buttons send messages to a synced device via Bluetooth LE technology. 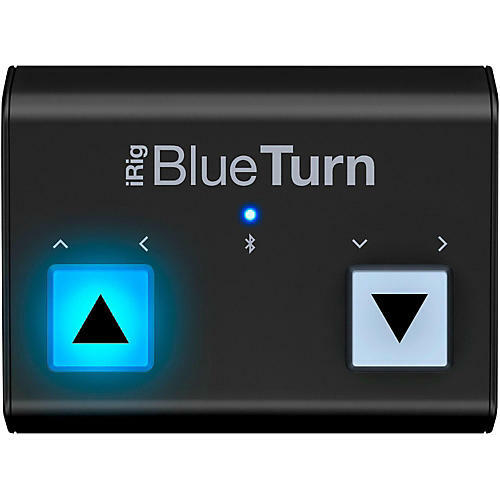 Just pair the BlueTurn with your device or computer, fire up a compatible app — it works with all of the popular page turning and document viewing apps and software including Adobe Reader and IK's own iKlip Stage — and you'll be ready to go. The BlueTurn Wireless PageTurner's buttons can be used in three different configurations: They can send Page Up/Page Down, Arrow Up/Arrow Down or Arrow Left/Arrow Right commands depending on what you want to do. These different modes can all be chosen directly from the hardware when powering up. This simple solution can be used with an iPhone, iPod touch, iPad, Mac or any Android device with OS 4.3 and above that supports Bluetooth LE.